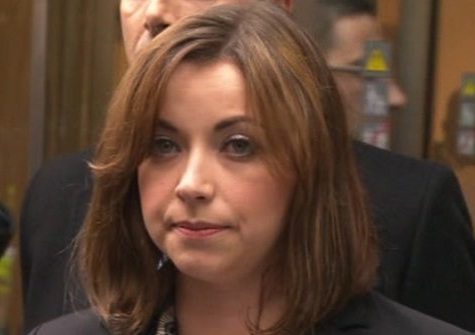 Charlotte Church says she was "sickened and disgusted" by what she discovered during her legal action against News International over phone hacking. Ms Church and her parents have agreed damages and costs of £600,000 with News Group Newspapers - publishers of the defunct News of the World. The High Court heard the singer's phone was hacked when she was 16 years old. The court agreed that 33 articles in the paper had been due to her family's voicemails being hacked. The settlement includes £300,000 in legal costs and a public apology. Speaking outside the Royal Courts of Justice in London, Ms Church said it was an "important day" for her and her family. "What I have discovered as the litigation has gone on has sickened and disgusted me. "Nothing was deemed off limits by those who pursued me and my family, just to make money for a multinational news corporation." The court heard Ms Church's phone was hacked in 2002 and journalists also placed her under surveillance and gained access to her medical records. The court heard her mother, Maria, was at "her lowest ebb" and was "coerced" into an interview with the paper's journalists about how she had self-harmed and attempted suicide after reporters gained information from hacked voicemails about her medical history. The family's solicitor, Mike Brookes, told the court: "She felt she had no choice but to give the interview and was deeply traumatised by the publication of the story in the NoW." He said: "The NoW targeted Charlotte and her voicemail messages repeatedly, and in doing so unlawfully obtained her private medical information and details of her personal relationships with her family and friends. "Even her first teenage boyfriend. They then ran stories about Charlotte using this information." BBC legal affairs correspondent Clive Coleman said the award, the last of the first wave of 60 settlements, was one of the highest. Former cabinet minister Tessa Jowell was awarded £200,000, while actor Jude Law received £130,000. He said it gave an insight into some of the things that had taken place and the deeply personal nature of the intrusion which Ms Church was clearly very, very angry about outside court. "We got a sense of how important the process of litigation here is, the process of discovery, with Ms Church saying it has only been in the last few days that she really learned the full extent of what had been happening," our correspondent added. Ms Church said she had discovered that, despite an apology she believed the paper was "not truly sorry, only sorry they got caught". She added that "money could never mend the damage that was done," and she would use her portion of the settlement to protect her children from further invasions of privacy. Michael Silverleaf QC, for NGN, said: "NGN acknowledges that they should never have had to endure what they have suffered and that NGN are liable for the damage that they have caused," he said. The 26-year-old singer said she was now planning to focus on helping the criminal investigation and Lord Justice Leveson's inquiry into media ethics. In November, she told the Leveson Inquiry that her mother had attempted suicide "at least in part" because she had known the newspaper was going to publish details of her father's affair. She told the hearing paparazzi had taken pictures up her skirt, there were photographers outside her house on most days and her manager had found evidence of a camera hidden in a shrub outside her home. A 41-megapixel Nokia smartphone was among the new technology on show during the opening day of Mobile World Congress in Barcelona. 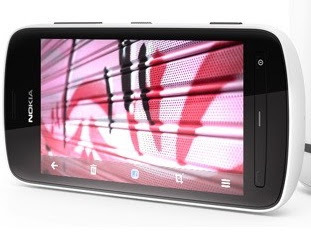 The 808 Pureview offers enhanced low-light performance as well as sophisticated image compression designed to help users share pictures. Nokia hopes to regain ground lost to Google and Apple in the mobile market. However, some have criticised Nokia's decision to use its own operating system, Symbian, on the device. Nokia's other smartphones typically run on Microsoft's Windows Phone software. Symbian, which first appeared on Nokia phones in the 90s, is widely regarded as inferior to the app and social media-driven Windows Phone system. "The Pureview 808's Symbian Belle operating system might detract from its appeal to a broader market, where it deserves recognition," said Tony Cripps, a principal analyst with Ovum. 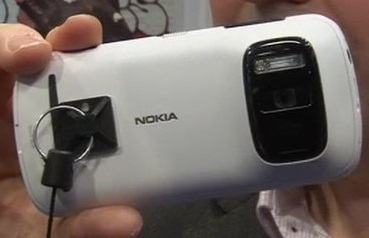 "It's a pity that Nokia was unable to combine the photographic prowess of the PureView 808 with the style of the Lumia 900. "Such a device may well have been the first smartphone to truly deserve the title of 'superphone'." Nokia claims the 808 sets a "new industry standard" in mobile imaging devices. "People will inevitably focus on the 41 megapixel sensor," said Jo Harlow, executive vice-president of Nokia smart devices. "But the real quantum leap is how the pixels are used to deliver breathtaking image quality at any resolution and the freedom it provides to choose the story you want to tell." The BBC's technology correspondent Rory Cellan-Jones said he expected some consumers would be surprised over the choice of platform. Nokia say the 808 will set a "new industry standard"
"Nokia's put this on a Symbian phone, which will seem strange to people," he said. "It's also pretty chunky, pretty heavy - but it does take amazing pictures." Also on show were new models in the company's Lumia range - including the 610, a cheaper device aimed at a "younger audience". The firm also announced it plans to make the Lumia available in China "in the coming months". Nokia's chief executive Stephen Elop said that introducing the cameraphone and entry-level smartphone were "the actions necessary to improve the fortunes of Nokia". Once the mobile world's dominant player, Nokia has struggled to compete as sales of Google and Apple devices have soared in recent years. Last month Nokia announced it was to stop manufacturing mobile phones in Europe, instead relocating to Asia at a cost of 4,000 jobs. (Reuters) - Hollywood showed some love for its history at the Oscars on Sunday, giving its best film award and four others to silent movie "The Artist" in a ceremony that recalled why cinema is special to so many people. The Academy of Motion Picture Arts and Sciences also gave Oscars to Meryl Streep playing former British Prime Minister Margaret Thatcher in "The Iron Lady," marking Streep's third Academy Award in 17 nominations, and veteran Christopher Plummer made history by becoming the oldest winner ever at age 82 with his role as an elderly gay man in "Beginners." But it was the "The Artist," a French movie that has been called a love letter to old Hollywood by its makers, that charmed Oscar voters. Made in the style of old silents, it tells a romantic story of a fading star in the era when silent movies were overtaken by talkies. 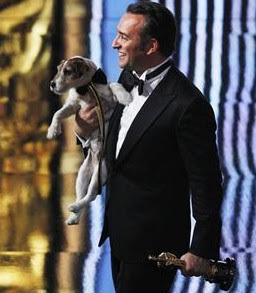 "The Artist" collected Oscars for its star Jean Dujardin and director Michel Hazanavicius, as well as for musical score and costume design. "I am the happiest director in the world right now. Thank you for that," Hazanavicius told the audience of stars including George Clooney, Michelle Williams, Angelina Jolie, Brad Pitt and members of the Academy. Dujardin was equally excited, exclaiming "I love this country" before thanking the Academy, the film's makers and his wife, and calling silent actor Douglas Fairbanks an inspiration. Streep's victory surprised Oscar pundits who thought Viola Davis would win the Academy Award with her portrayal of a black maid in a southern white home in civil rights drama "The Help." But Streep's turn as an elderly Thatcher who is slipping into dementia was too good to be ignored. It was Streep's third Academy Award out of 17 nominations, and even she reckoned that Oscar voters would think she's been there, done that. Backstage she termed it "Streep fatigue" to reporters. "When they called my name, I could feel America saying, 'Oh why her again?' But whatever," she joked. Yet even the steely veteran could not hold back the emotion of an Oscar victory. When she thanked her husband and talked about her career she came close to breaking into tears, and backstage she said it made her feel like a kid again. Veteran Plummer, a star of classic film "The Sound of Music," won his first ever Oscar for his portrayal of an elderly gay man who comes out to his family in "Beginners." Spencer, a relative newcomer in contrast to Plummer, had to hold back tears as she accepted her trophy for her portrayal of a black, southern maid in civil rights drama "The Help." Director Martin Scorsese's "Hugo," which like "The Artist" pays tribute to early filmmaking, came into the night with a leading 11 nominations - one more than "Artist" - and also picked up five wins. But its Oscars came in technical categories cinematography, art direction, sound editing and mixing and visual effects. Another highly touted movie, family drama "The Descendants," walked off with only one Oscar, adapted screenplay for its writer and director Alexander Payne and co-writers Nat Faxon and Jim Rash. Woody Allen won for original screenplay with "Midnight in Paris," but he was not on hand to accept his trophy. In other major wins, the foreign language film award went to Iranian divorce drama "A Separation." "I proudly offer this award to the people of my country, the people who respect all cultures and civilizations and despise hostility and resentment," said its director, Ashgar Farhadi. Asked backstage how he thought the Iranian government might respond, he said he really did not know. "I can't predict what's going to happen," he said. "Rango" claimed best animated film, while "The Iron Lady," won a second award for makeup. The documentary category saw another major surprise for "Undefeated," a film about football players in a poor struggling community to make their lives better. "Paradise Lost 3: Purgatory" had been widely picked to win by pundits. One of the film's makers, T.J. Martin, used an expletive onstage in a sign of his joy, but it was edited out for television audiences. He apologized backstage in the press room. Comedian Billy Crystal, who returned to emcee the show for the ninth time, had the crowd laughing loudly with an opening video in which he was edited into the year's top movies. He was kissed by George Clooney on the lips in a scene out of "The Descendants" and even ate a tainted pie from "The Help." He opened with a monologue in which he joked: "there's nothing like watching a bunch of millionaires present each other with golden statues" and sang a comic song about the movies. Other highlights included stars like Morgan Freeman, Tom Hanks, Adam Sandler and others in brief video vignettes telling audiences why they loved movies. The clips highlighted this year's themes of reminding people what makes movies magical. Finally, Hollywood's biggest fashion parade on the Oscar red carpet heated up with Michelle Williams in a stunning red dress from Louis Vuitton, "The Help" star Jessica Chastain in a dazzling Alexander McQueen black and gold embroidered gown, while Gwyneth Paltrow chose Tom Ford and white, a popular color. (Reuters) - At least 31 Syrian civilians and soldiers were killed on Sunday in fighting over Syria's future that coincided with a vote on a new constitution that could keep President Bashar al-Assad in power until 2028. 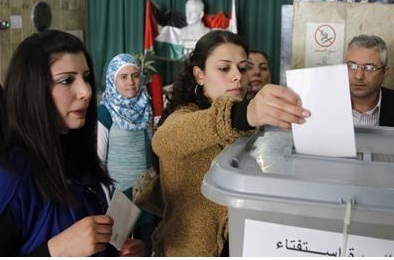 Voting was under way in the referendum on a new constitution, which Assad says will lead to a multi-party parliamentary election in three months, but his opponents see as a sick joke given Syria's turmoil. "What should we be voting for, whether to die by bombardment or by bullets? This is the only choice we have," said Waleed Fares, an activist in the Khalidiyah district of Homs. "We have been trapped in our houses for 23 days. We cannot go out, except into some alleys. Markets, schools and government buildings are closed, and there is very little movement on the streets because of snipers," he said. He said another besieged and battered district, Baba Amro, had had no food or water for three days. "Homs in general has no electricity for 18 hours a day." With most foreign reporters barred from Syria or heavily restricted, witness reports are hard to verify. The Interior Ministry acknowledged obliquely that security conditions had disrupted voting, saying: "The referendum on a new constitution is taking place in a normal way in most provinces so far, with a large turnout, except in some areas." The Syrian government, backed by Russia, China and Iran, and undeterred by Western and Arab pressure to halt the carnage, says it is fighting foreign-backed "armed terrorist groups." "There are some groups that have a Western and foreign agenda and do not want reforms in Syria and want to divert Syria's steadfastness," he told reporters in Damascus. "We are not concerned with this. We care about ... spreading democracy and freedom in the country," Safar said. "If there was a genuine desire for reform, there would have been movement from all groups, especially the opposition, to start dialogue immediately with the government to achieve the reforms and implement them on the ground." The outside world has been powerless to restrain Assad's drive to crush the 11-month-old revolt, which has the potential to slide into a sectarian conflict between Syria's Sunni Muslim majority and the president's minority Alawite sect. "I think there is every possibility of a civil war. Outside intervention would not prevent that, it would probably expedite it," she told BBC television in an interview. "If you bring in automatic weapons, which you can maybe smuggle across the border, what do they do against tanks and heavy artillery? There is such a much more complex set of factors." German Foreign Minister Guido Westerwelle said the referendum was "nothing but a farce." "Sham votes cannot contribute to a solution of the crisis. Assad needs to put an end to the violence and clear the way for a political transition," he said in a statement. "It is late at night and Baba Amro is still being bombarded. We can do nothing for this boy," said the doctor, who has also been treating Western journalists wounded in the city. The International Committee of the Red Cross said on Saturday it was still unable to evacuate distressed civilians from Baba Amro. After a day of talks with Syrian authorities and opposition fighters, it said there were "no concrete results." In Hama, another city with a bloody record of resistance to Baathist rule, one activist said nobody was taking part in the referendum. "We will not vote on a constitution drafted by our killer," he said by satellite telephone, asking not to be named. If the constitution is approved in the vote, a foregone conclusion, it would drop an article making Assad's Baath party the leader of state and society, allow political pluralism and enact a presidential limit of two seven-year terms. Dozens of people lined up to vote in two polling stations visited by a Reuters journalist in Damascus. "I've come to vote for President Bashar, God protect him and give him victory over his enemies," said Samah Turkmani, in his 50s. Another voter, Majed Elias, said: "This is a national duty, whether I agree or not, I have to come and vote." This is Syria's third referendum since Assad inherited power from his late father. The first installed him as president in 2000 with an official 97.29 percent 'Yes' vote. The second renewed his term seven years later with 97.62 percent in favor. The re-sale price follows the same trajectory as the iPhone, experts say. As SmartMoney.com reported, the iPhone 4 declined 20% to 25% in value on re-sale sites during the immediate launch period of the iPhone 4S, but this leveled out as the excitement over the launch subsided. The iPad 2 will likely experience a similar percentage decline after the iPad 3 is announced, says Ashley Halberstadt, a spokeswoman for re-sale site Nextworth.com. That said, LoCastro says re-sale sites want to offer aggressive pricing now in order to buy up as many units as possible while people are looking to sell — so he doesn’t rule out an uptick in price on the day the iPad 3 is announced. 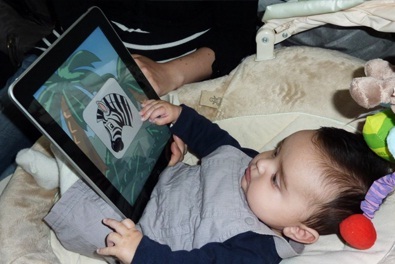 However, if Apple decides to continue selling the iPad 2 at a discount alongside the spanking new iPad 3, the re-sale market for old tablets will experience an even bigger hit, LoCastro says. “This is just a rumor and many are skeptical, but if it proves true the trade-in value for your used iPad 2 will immediately plummet,” he says. (Apple did not respond to requests for comment.) That said, the value of Wi-Fi only iPads typically hold up better on the re-sale market because they don’t involve buyers taking out a two-year data plan, Halberstadt says. Prices vary on re-sale sites, too. NextWorth.com will pay $272 for a 16-gigabyte iPad 2 in “good” condition– a 45% depreciation on the price of a new $499 iPad 2. Gazelle.com, a competing re-sale site, will buy a similar iPad 2 for $260. Both sites offer “lock-in” prices for an agreed period of time before the tablet sells. Nextworth has a lock-in period of 21 days, while Gazelle pledges a slightly more generous 30-day lock-in period. More adventurous consumers may prefer holding onto their iPad 2 until the last minute and selling it on eBay themselves, says Yung Trang, president of TechBargains.com. Currently, the iPad 2 is selling on eBay for around $300, a far more attractive price for sellers than both Netxtworth and Gazelle, he says. Plus, Trang says people may be reluctant to part with their iPad 2 now — if only because they will be left empty handed until the spring, when the new iPad is expected to actually go on sale. “That’s my dilemma,” he says. “The question really is this: Is the incremental $50 to 100 you gain now worth not having an iPad for nearly a month?” The alternative, he says, is give the used iPad to your children. (Reuters) - Twelve people were killed on Friday in the bloodiest day yet in protests that have raged across Afghanistan over the desecration of copies of the Muslim holy book at a NATO military base with riot police and soldiers on high alert braced for more violence. The burning of the Korans at the Bagram compound earlier this week has deepened public mistrust of NATO forces struggling to stabilize Afghanistan before foreign combat troops withdraw in 2014. Hundreds of Afghans marched toward the palace of Afghan President Hamid Karzai in Kabul, while on the other side of the capital protesters hoisted the white flag of the Taliban. Chanting "Death to America!" and "Long live Islam!," protesters also threw rocks at police in Kabul, while Afghan army helicopters circled above. Friday is a holy day and the official weekly holiday in Afghanistan and mosques in the capital drew large crowds, with police in pick-up trucks posted on nearby streets. Armed protesters took refuge in shops in the eastern part of the city, where they killed one demonstrator, said police at the scene. In another Kabul rally, police said they were unsure who fired the shots that killed a second protester. Seven more protesters were killed in the western province of Herat, two more in eastern Khost province and one in the relatively peaceful northern Baghlan province, health and local officials said. In Herat, around 500 men charged at the U.S. consulate. U.S. President Barack Obama had sent a letter to Karzai apologizing for the unintentional burning of the Korans at NATO's main Bagram air base, north of Kabul, after Afghan laborers found charred copies while collecting rubbish. Afghanistan wants NATO to put those responsible on public trial. In neighboring U.S. ally Pakistan, about 400 members of a hardline Islamist group staged protests. "If you burn the Koran, we will burn you," they shouted. To Afghanistan's west, Iranian cleric Ahmad Khatami said the U.S. had purposely burned the Korans. "These apologies are fake. The world should know that America is against Islam," he said in a speech broadcast live on state radio. "It (the Koran burning) was not a mistake. It was an intentional move, done on purpose." Most Westerners have been confined to their heavily fortified compounds, including at the sprawling U.S. embassy complex and other diplomatic missions, as protests that have killed a total of 23 people, including two U.S. soldiers, rolled into their fourth day. The embassy, in a message on the microblogging site Twitter, urged U.S. citizens to "please be safe out there" and expanded movement restrictions to relatively peaceful northern provinces, where large demonstrations also occurred Thursday, including the attempted storming of a Norwegian military base. The Taliban urged Afghan security forces Thursday to "turn their guns on the foreign infidel invaders" and repeatedly urged Afghans to kill, beat and capture NATO soldiers. Germany, which has the third-largest foreign presence in the NATO-led war, pulled out several weeks early of a small base in the northern Takhar province Friday over security concerns, a defense ministry spokesman said. (Reuters) - Iran has sharply stepped up its controversial uranium enrichment drive, the U.N. nuclear agency said on Friday in a report that will further inflame Israeli fears the Islamic Republic is pushing ahead with atomic bomb plans. The nuclear watchdog also gave details of its mission to Tehran this week where Iran failed to respond to allegations of research relevant to developing nuclear arms - a blow to the possible resumption of diplomatic talks that could help calm worries about a new war in the Middle East. Iran's increase of work that can have both civilian and military purposes underlines that it has no intention of backing down in a long-running dispute with the West that has sparked fears of war. U.S. crude futures extended a rally on the IAEA's findings, which added to concerns that Iran's tensions with the West would escalate. It gained more than $2 to hit the highest intraday price in nine months. The White House said the IAEA report confirmed that Iran was violating U.N. Security Council resolutions with its nuclear enrichment program. "When combined with its continued stonewalling of international inspectors, Iran's actions demonstrate why Iran has failed to convince the international community that its nuclear program is peaceful," White House National Security Council spokesman Tommy Vietor said in a statement. In what would be a big expansion, Iran has increased the number of centrifuge machines enriching uranium - material that can be used to make atomic bombs if refined much further - by roughly a third since late last year, the report indicated. Preparatory work to install thousands more centrifuges is under way, potentially shortening the time needed to make high-grade uranium for a nuclear weapons. Tehran says its nuclear program is exclusively for civilian purposes, but its refusal to curb enrichment has drawn increasingly tough sanctions on its oil exports. Iran's ambassador to the IAEA said the report had vindicated its position and insisted Tehran had no intention of giving up its nuclear march. "The IAEA report indicated that all Iran's nuclear activities are under the supervision of the agency," the semi-official Fars news agency quoted Ali Asghar Soltanieh as saying. "It shows again that Iran's nuclear activity is peaceful." Labels: iran, Iran has expanded sensitive nuclear work: U.N. agency, nuclear plant, U.N., u.s.
London (CNN) -- Building a home with a floor beneath ground on a plot next to a flood-prone river might seem like a recipe for disaster. But not when it's designed to float. The "amphibious house" was recently granted planning permission for construction on a island on the River Thames in Marlow -- a small town 35 miles west of London. The upper part of the house is constructed from lightweight timber, according to its creators Baca Architects, while a concrete basement level sits inside a "wet dock" consisting of a base slab and four retaining walls. Should the worst happen the house turns into a "free-floating pontoon" with vertical guideposts running up the building's exterior preventing it from drifting off downstream. A terraced garden will also surround the property encouraging incremental flooding while also helping manage run-off when water levels start to subside. Richard Coutts, director of Baca Architects said in a statement: "From the outset, we sought the expert advice of the (UK) Environment Agency to determine the most appropriate construction model to mitigate flood risk on the site and provide a safe dwelling, sympathetic to its setting and fit for the challenges of the 21st century. "Amphibious design is one of a host of solutions that can enable residents to live safely and to adapt to the challenges of climate change," he added. 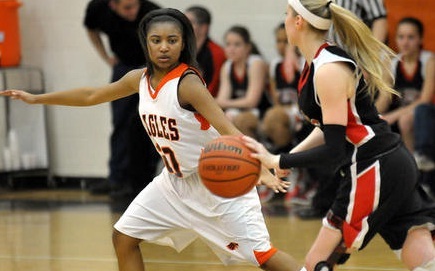 SOUTH CHARLESTON, W.Va. -- Never behind and never in doubt, South Charleston rode the shooting stroke of senior Brittany Gordon to the Class AAA Region 4 Section 1 championship game. Gordon posted a career-high 42 points to lead the Black Eagles in a sectional semifinal game they never trailed for an eventual 89-45 win against St. Albans at South Charleston High School on Wednesday night. South Charleston Coach Gary Greene said Gordon's offensive success was a result of St. Albans' decision to pack the interior. "St. Albans decided they weren't going to let us get anything inside, so they were double- and triple-teaming the post in there ball-side and it opened up the top," he said. "Brittany just took what they gave her. They were doubling down so much, even when she was outside the 3. She got some great looks, as well as some of our other guards." Gordon, a guard, finished the game 15-of-25 from the field, including 6-of-8 from 3-point range. Gordon scored 11 points in each of the first two quarters as the Black Eagles built a 50-23 halftime lead. Gordon said she agreed with her coach's assessment that the Red Dragons' inside-first defense led to her offensive outburst. "They were doubling down on our post players and it left a lot open for the guards - I was on tonight," she said. Red Dragons Coach Scott James said his team lacked the fire early in the game as St. Albans (7-17) fell behind and Class AAA No. 3 South Charleston took advantage. "We've got to come out with a purpose every single game and with that, intensity follows," he said. "At times we showed that, but tonight was a shame that we had to go out the season this way, but my hat's off to South Charleston. They did a great job." 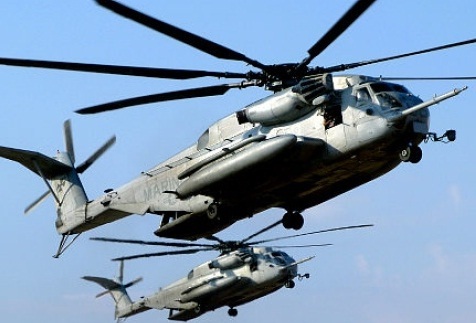 SAN DIEGO - Two Marine Corps helicopters collided over a remote section of the California desert during a nighttime exercise, killing seven Marines in one of the Corps' deadliest training accidents in years. The weather was mild on Wednesday when the helicopters were flying as part of a two-week standard training called "Scorpion Fire" that involved a squadron of about 450 troops from the 3rd Marine Aircraft Wing. The wing has about 17,500 Marines and sailors, including six helicopter squadrons that fly both Cobras and Hueys. It's headquartered at Miramar Marine Corps Air Station and also has personnel stationed at Camp Pendleton and Yuma. Depending on your insurance agent you may also see discounts as you age beyond 25. These discounts usually cease once a driver reaches their mid 50’s, though you may be eligible to receive other discounts on your car insurance at that time. This is why agents always make sure your home address and telephone number is correct. They use this information to determine if you live in a low-risk neighborhood or a high-risk area, and they compare with your employer’s information to determine how long of a commute you have back and forth each day. This will determine the exact rate of your cheap car insurance. On the other hand, First of all, some vehicles are simply more reliable than others. A used vehicle that’s been on the road for 20 years is not nearly as reliable as a brand new car. Though it may be more affordable to buy the older, used car, you may wind up paying higher insurance rates because of it. Owners of sports cars and luxury vehicles can also expect higher premiums than most other drivers. These automobiles are usually capable of much greater speeds than other vehicles on the road, and some may even have upgrades or aftermarket parts added on. All of this increases the risk of an accident or breakdown, and your agent will charge you extra for the coverage. Most drivers don’t realize this, but most agents will actually allow you to raise the deductible amount in order to lower your monthly rates. If you’re looking for cheap car insurance then this is a good deal for you; especially if you have a clean driving record as you may not ever have to actually pay this deductible. Ask your agent if they offer this service and, if they do, ask them how much you’ll be able to save by going with an increased deductible. The answer may surprise you. Other types of insurance include health, dental, life, and travel. Depending on the company you are working with, you may be able to combine these types of insurance to receive cheap car insurance as well. This will save you even more money on a monthly basis. Multiple drivers can also be added to an insurance policy, allowing you to further reduce your auto insurance premiums. This includes spouses, boyfriends or girlfriends, and even roommates. Remember to comparison shop and do the math beforehand, however; in some cases it is cheaper to hold policies with separate insurance companies. In fact, even if you have a vehicle thats not working, adding it to your insurance policy can save you a lot of money in some cases. When looking for cheap car insurance, agent loyalty can be your best friend. Once you find an insurance company that offers the amount of coverage you need for the right price, develop a relationship with them. Get to know your local insurance agents and most importantly, stick with the same company year in and year out. After all, if you’re already receiving great rates and the coverage you need there’s simply no reason to go elsewhere and look for a new policy with a new company. If your vehicle is valued at less than $1,000, you may also want to consider dropping your collision and comprehensive coverage. In cases like this it might not be worth it financially to repair your vehicle after a crash or accident. As long as you maintain storage insurance on your vehicle while it is being stored away, no matter the location, then you can save yourself a lot of time, frustration, and money if something does happen to your vehicle. You should also request a copy of your credit report on an annual basis, even if you know your report is clean. Identity theft is on the rise, and many innocent victims could have been spared if they only would have been monitoring their credit report more closely. Also remember that if you do happen to get into an accident while on a program like this it’s going to be extremely difficult to regain your safe driving benefits and you’ll certainly see a rate increase at least for the first couple years. Remember that if you ever get a ticket, going to the driving school may help as well. Things to look for when taking vehicle safety into mind include automatic seatbelts, as this feature almost guarantees that both the driver and passenger will be wearing their belts at all time, and both driver-side and passenger-side airbags. Airbags in the rear seats of the vehicle can also help to improve the safety rating of your car, thereby lowering your monthly car insurance rates in the process. Make sure your windshields and windows are free of cracks and chips, and make sure all of your mirrors are intact. If your vehicle is visually inspected by an agent, faults like this will surely result in higher insurance rates. If your vehicle doesn’t already have an alarm and you want cheap car insurance, it may be worthwhile to pick up a brand new system and have it installed. Today’s vehicle alarm systems are not nearly as expensive as they used to be, they are quick and easy to install for anyone with common automotive knowledge, and they can save you a lot of money not only on your car insurance, but in case someone tries to break-in to your vehicle as well. With all of the reasons in front of you, it’s hard to say no to a car alarm. Since every company has different rules and discounts, check with them to see which security devices will give you the best discounts. If your car is parked in a private garage on your property, however, you are likely to see a sharp decrease in your auto insurance coverage. This is not to say that a garage is a foolproof method of protecting your vehicle or your property, but it can help deter thieves. Insurance agents know this, and they’re willing to charge you a little bit less if you are able to park in a garage at night. Even a simple carport may help lower your insurance rates; it never hurts to ask. Depending on your personal situation, it may be cost-effective to join a group solely based on the reduction of your auto insurance policy. Ask your insurer if they can provide a list of groups that provide these types of discounts, and look into joining any that interest you. Driving classes are offered by a variety of organizations, both public and private. If there are any types of driving classes available through your insurance agent, you may want to consider attending and completing them in order to find cheap car insurance through an existing insurer. If you are unaware of any classes being offered in your area ask your agent; they’ll be glad to help. Be aware that if you take a class and fail, however, you may end up with an increased insurance rate instead. There are many different types of driving classes, but defensive driving classes are usually the most effective at reducing your car insurance premiums. Note that you will probably be required to show your agent proof of completion (usually in the form of a certificate) in order to be eligible for any benefits, so you won’t be able to fake it. Of course you’re going to need proof of your educational achievements, so get a copy of your most recent report card and bring it in to your local insurance agent. You may be surprised to find an instant reduction in the amount of money you pay each month for car insurance. The amount of time you spend on the road, as well as the actual mileage you put on your vehicle can also be factored in when determining your cheap car insurance premium as well. If you don’t drive very often and don’t put many miles on your vehicle, then you’re likely to be eligible for a rate reduction. Like with many of the other methods that can be used to decrease your premium, however, you’re going to have to ask for this discount specifically. Auto insurance discounts for low mileage are more actually more common than you might think. Insurance companies realize that there’s not as much risk involved with drivers who aren’t on the roads very often, and they’re usually willing to adjust your rates accordingly. If your current insurance company doesn’t offer any kind of low mileage discount, you may want to shop around until you find one that does. The amount of money you may be able to save is truly worth the time and effort. Some plans offer to replace your car with a new one of equal value if your car is wrecked in an accident, but this is actually referring to the value of your car at the time of the wreck and not at the time of the original purchase. Factor in depreciation, and you’re looking at recouping only a fraction of what you paid for your car. These types of “benefits” can be dropped from your auto insurance in order to make sure you are getting cheap car insurance from your insurer. LONDON (AP) — Soulful songstress Adele capped a momentous year of Grammy Awards triumph and medical woes with a double win at the U.K.'s Brit music awards Tuesday, taking prizes for album of the year and best British female solo artist before making an obscene gesture after the show's host cut her acceptance speech short. Her sophomore album "21" won six Grammys last week and has sold more than 6 million copies in the United States alone. But Adele also had to undergo vocal cord surgery in November to fix a potentially career-threatening throat condition. She delivered a powerhouse performance of her single "Rolling in the Deep" to thousands of fans and industry insiders at London's O2 arena. The 23-year-old lost out on the British single prize to boy band One Direction's "What Makes You Beautiful," but took the coveted album of the year award for "21." The statue was presented by singer George Michael, returning to the stage after suffering life-threatening pneumonia in December. Long derided as dull, the Brits have become a lively celebration of U.K. music and style — and this year's awards come with British music riding high around the world. Tuesday's event — which kicked off with Coldplay performing "Charlie Brown" and included live turns from Sheeran, Florence and the Machine, Noel Gallagher, Bruno Mars and Rihanna — brought out a host of stars who blended rock 'n' roll attitude and fashion finery. The Barbadian singer, who has often been in the news for non-musical reasons since her then-boyfriend Chris Brown attacked her at a pre-Grammy Awards party in 2009, thanked her fans. "At times when I feel misunderstood, my fans always remind me that it's OK to be myself," she said. "This award means much more to me than you know," said the singer, who has gone from Internet-fueled buzz to backlash in record time after a disastrous performance last month on "Saturday Night Live." The four original members — Albarn, Graham Coxon, Alex James and Dave Rowntree — performed together for the first time since a series of concerts in 2009, offering versions of 1990s hits including "Girls & Boys" and "Parklife." Ideal insurance policy is known as a great investment and is a significant way to be adopted to save the future of your family. If you get prepared with a superb insurance policy it comes to our save when you find yourself in troubled in any situation, as it also helps in gaining the economical strength relating to your children. To decide the true insurance policy, factors like reliability, price, budgets and flexibility play a significant role, and choosing the right life insurance company also becomes a crucial decision. Organizations that stand the top 10 life insurance companies in USA for 2012 can be justified as per their reputation and according to their sales volumes. Find a list of top 10 insurance coverage companies in USA which enjoys reputation as well as are insurance coverage businesses that register phenomenal growth in their revenues, season after season, and on top of it are esteemed businesses that provide excellent service. MetLife is a renowned life insurance company in the USA, and it provides Term Life Insurance which gets provided in three modes. Their commitment to provide service to the underprivileged and the marginalized has catapulted MetLife into one of the top life insurance provider, and their Corporate Social responsibility has helped them stay afloat in the healthy competition that prevails in the life insurance market in the USA. Having an international presence, MetLife is one of the top 10 life insurance companies in the USA which also offers Permanent Life Insurance to the citizens of the USA. MetLife happens to be the top life insurer in the USA, and is a leader in retirement and savings policy among the other areas of significance. Prudential Insurance Company of America happens to be a part pertaining to Prudential Financial and is one of the top notch insurance players that provide life insurance to many in the USA. As one of the top 10 life insurance companies in the USA, this life insurance company offers life insurance policies under five categories, which are the Term Life Insurance, Universal Life Insurance, Whole Life Insurance, Variable Life Insurance and Survivorship Life insurance. To cater to the varied needs of the individuals who seek to acquire life insurance policy, Prudential Insurance Company of America offers insurance under these categories that carry many benefits. Being a major player to occupy centre stage in the life insurance market in the USA, New York Life Insurance has changed its offerings as in a way to suit the times, and in effect has trimmed their strategy and operations to meet the varied requirements of individuals as well as to fall in line with the market. This life insurance company provides life insurance policies that get classified into four categories, which embrace the term insurance, permanent life insurance, survivorship insurance as well as life insurance for that of business. New York Life Insurance has been receiving highest rankings in the life insurance industry, and the ratings have been provided by the best of insurance rating agencies, as it is undoubtedly a major player to find a place in the top 10 insurance companies in the USA. The primary focus pertaining to TIAA-CREF is life insurance, and there are various lines of life insurance at TIAA-CREF, which includes level as well as renewable term, apart from that of the universal as well as survivorship life insurance. This insurance company is one among the top financial services organizations in the USA as it offers term insurance in two types and permanent insurance in two types. Headquartered in New York, it has 60 branches spread across the USA, and with its performance, it enters the list of top 10 life insurance companies in the USA. Earning good rankings from the reputed insurance rating agencies, this insurance company is also one of the insurance companies that stays on top when sales is concerned. MassMutual Financial Group happens to be the marketing name pertaining to Massachusetts Mutual Life Insurance Company which has its headquarters at Springfield. As one of the leading insurance companies in the USA, the term-life insurance related to MassMutual offers coverage for that of set periods pertaining to time. The financial strength of this life insurance company as well as its strong performance has registered tremendous growth, and to satiate the needs of clients, MassMutual Financial Group also offers disability income insurance, retirement plan services, long term care insurance as well as annuities. As one of the best insurance companies in the USA, it strives to help clients in the decision making process with respect to their financial planning. Lincoln National is one of the reputed insurance companies in the USA, and the types pertaining to life insurance that comes from the stable of Lincoln National include Term Life, Universal Life, Linked Benefit Life and Variable Universal Life. Known for their focus to provide professional financial advice, Lincoln National provides a wide range of insurance products that addresses the long-term needs of the individuals seeking insurance policies, as it also offers annuities. It is one of the successful as well as the largest of life insurance companies found in the USA, and is a strong contender to enter the list of top 10 life insurance companies in the USA. Consistently rated as the one of best, Genworth Financial life Insurance is headquartered in Richmond as it offers traditional term life insurance, universal life insurance and term life insurance with that of premium options. As one of the prime providers of life insurance in the USA, it also finds a place in the top 10 insurance companies in the USA. The financial strength of this insurance company in meeting the obligations related to policy holders doesn’t come as surprise to many, as this factor has not only earned recognition for Genworth Financial but also has been a major reason for the top insurance rating companies to shower praises on this insurance provider. American Family Life Assurance Company or the AFLAC happens to be a top rated US insurance companies as it unveils a host of health and accident insurance policies, which comes as perfect solutions to individuals as well as to employers. Based in Columbus, AFLAC is a behemoth, as it possesses massive assets and the clientele encompasses sea of individuals found around the globe, and which is also a top life insurance player in the USA. It strives to offer affordable life insurance products to employers and customers, as innovative strategic marketing that entwines with that of well-researched as well as quality products have paved way for value for money and cost-effective life insurance plans, which ultimately has pushed this life insurance company into the list of top 10 life insurance companies in the USA. Principal Financial is another reputed life insurance company in the USA that provides insurance policies for businesses as well as individuals. Quality service is an inherent feature of this life insurance company, and apart from offering life insurance it also offers dental and vision insurance. The life insurance encompasses varieties like term insurance, survivorship life insurance, group health insurance among the other types, and it also provides aid for individual retirement planning. It is one of the top 10 life insurance companies in the USA that provides excellent services. If you think that a life insurance company in the USA of repute has been left out in this list, please let us know as well as provide your comments.